The Dotted Line: What’s left for Texas to accomplish in the 2019 recruiting class? Crunch time arrived for the 2019 class when contact period began Monday. The Longhorns won’t be on the road this week; instead, the coaching staff is preparing the team for a Big 12 showdown with Oklahoma. Texas’ class consists of 22 members and ranks seventh in the nation. Eleven of those commitments hail from out of state and the Longhorns are still working on a handful of top targets before closing shop. McCoy was a longshot when the Longhorns hosted him and his family for the USC victory back in September. But the directions of the two programs since that day have put Texas squarely in the mix for the best athlete in the country. McCoy is the rare two-way college player. He wants to play wide receiver and be a specialist at outside linebacker. He’ll announce his decision live at the All-American Bowl in San Antonio on Jan. 5. It’s a two-team race between the Longhorns and USC. Texas started the cycle hoping Cain would be one of the running backs in this class and it’s looking more likely that the Longhorns lead for Cain. The former Denton Guyer star is set to pick a school on Dec. 19, the first day of the early signing period. He plans to make that decision in Dallas. Texas wants two running backs in the class and Cain would be the perfect complement to Derrian Brown. Both of those guys can see the field as freshmen with only Keaontay Ingram showing glimpses of a real future. The main question mark remaining for the Longhorns is at offensive line. Texas holds just two commitments at tackle and none in the interior. Hookfin emerged as a target late in the cycle and Texas is the odds-on favorite to land the athletic tackle from south Houston. Hookfin isn’t as polished as fellow commit Tyler Johnson or as freakishly talented as Javonne Shepherd, but he’ll be allowed a redshirt year and time to develop under assistant coach Herb Hand. Texas needs instant help along the line heading into 2019 with the Longhorns losing three starters — left tackle Calvin Anderson, right guard Elijah Rodriguez and left guard Patrick Vahe. It wouldn’t shock anyone if Texas honed in on a JUCO lineman or even explored the grad transfer market like it did for Anderson in 2018. Assuming Texas keeps Johnson and Shepherd committed and lands Hookfin, only one more prospect would be needed at the position. JUCO talents like Bamidele Olanseni and Myron Cunningham already hold UT offers and that number should increase once the staff can hit the road following Saturday’s rematch with Oklahoma. Three prep prospects for the future and one JUCO player to immediately provide depth or compete for a starting spot would be a solid haul for Hand in his first cycle controlling the offensive line. Texas Tech just lost its coach. TCU barely qualified for a bowl game. Texas is playing for a conference championship. See the difference? Prospects are noticing the rise of the Longhorns and it’s the perfect time for the staff to explore the commitment status of any prospects that could help the 2019 class. One such prospect is Katy Taylor offensive tackle and TCU commit Andrew Coker. Another is Texas Tech-bound defensive end Steven Parker. Texas is in the power position within the state right now on the recruiting trail and there’s no better way to flex muscle than to flip a recruit this late in the cycle. 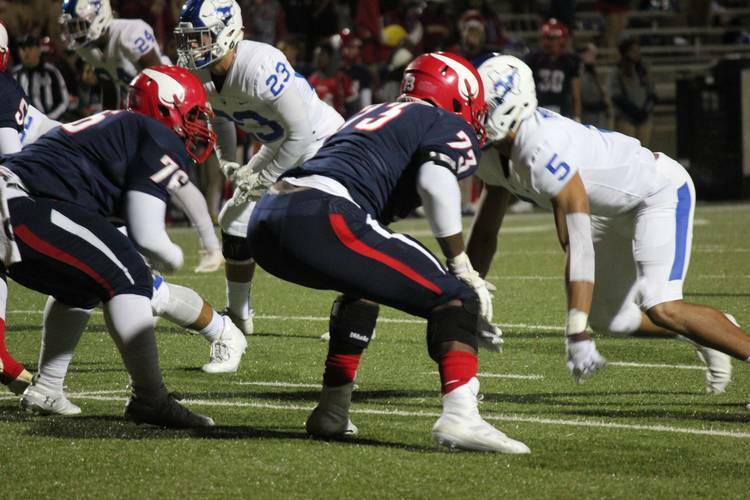 The Longhorns can afford to cherry-pick the remaining members of the 2019 class and a few of those members might just be committed to rival schools at the moment.